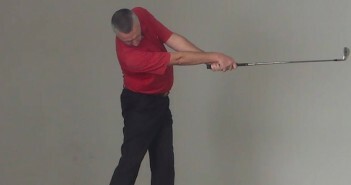 With this drill, you will learn how to solve one of the greatest problems faced by golfers at all levels, maintaining posture in your downswing. Maintaining posture, keeping your spine angle, staying “in the shot”, whatever you call it, it is probably the most important component of great ball striking, and it’s the thing that most golfers struggle with more than anything else. The ability to stay in posture in the downswing is the single biggest differentiator between a great golfer and a high handicapper. This simple drill will quickly teach you how it’s done. Actually, as we’ve discussed previously, maintaining your “spine angle” is a bit of a misnomer. The various elements of your spine move through an infinite number of angles as it twists and turns, tilts, flexes and extends, throughout the golf swing. But it’s true to say that the overall angle of your spine, from your sacrum (just below the lumbar vertebrae) to the base of your neck (cervical vertebrae), when viewed from down the line, should remain broadly fixed, from setup through to impact and beyond. If you can maintain your posture in the downswing, everything becomes easier. You can swing more efficiently, more freely, with less moving parts, and with more power, consistency and accuracy. If you can’t, if you “stand up”, as the vast majority of amateur golfers do, then your golfing life gets a whole lot more difficult! You can’t generate the same power, and you can’t transfer power efficiently through to the golf club. You’re likely to release the golf club early, and to experience all manner of nasty results – including blocks and hooks, and hitting the ball either fat or thin. Not much fun at all! The problem becomes much more difficult with the longer clubs, because the forces trying to pull you off balance are so much greater, which is the main reason why the average golfer can hit a 9-iron okay but really struggles with a 3-iron. You need a series of precisely timed compensations just to hit the golf ball. And yet more compensations to square the club face through impact. In fact, most golfers display an astonishing level of athleticism in just being able to propel the ball with any power in roughly the right direction. You are a miracle of nature! Unfortunately, it’s just not possible to do this with any consistency. To be a good golfer, you must, first and foremost, bring the club back to the ball with a square club face, and strike the ball with the centre of the face. If you are just slightly out, then your accuracy and consistency will suffer, and it will show on your scorecard. Striking the ball cleanly and finding the club’s sweet spot will produce consistent distance, and control of distance will dramatically lower your scores. To achieve this, your axis of rotation through impact must be in a consistent position – you must maintain your posture. So, maintaining posture will enable you to strike the golf ball better, giving you better accuracy and consistency, more distance and lower scores. Oh, and it’s kinder to your body, too. What’s not to like? Yet few golfers can do it, despite the huge body of golf tuition available. It is probably the single most frustrating, yet important, aspect of the golf swing. Part of the problem is that golfers focus on “keeping their head down”, causing them to get all “bunched up” with their upper body in response to losing posture, which just exacerbates the problem. It also forces them to drop their chin into their chest, restricting the movement of the cervical vertebrae and destroying their ability to turn effectively and efficiently. To maintain posture, you need to counterbalance the forces generated by your swinging arms and the golf club. If you try to keep your balance with your upper body, which you instinctively do (it’s the upper body that controls the golf club, right? ), then you’ll stand up. Higher handicappers also pull their arms in towards their chest and shrug their shoulders, for the same reason. As you’ll see here, maintaining posture is more about your lower body – keeping your “tush” back, away from the ball, in order to balance the golf swing. Once you learn how to use your lower body properly, “staying down” just takes care of itself, leaving you free to swing the golf club. It is important to remember that this is a drill, we’re isolating and exaggerating certain movements – the real golf swing will be different since it incorporates a number of other movements, but the feelings and movement patterns that you are ingraining here will quickly improve your golf swing. Caution: This drill involves moving your body in a way that is probably new to you. We strongly recommend that you warm up before working on it, as you should with any physical exercise. This is a great time to practise your Perfect Golf Warm Up. …you become more proficient, you should be able to perform this drill at speed, in one fluid motion. 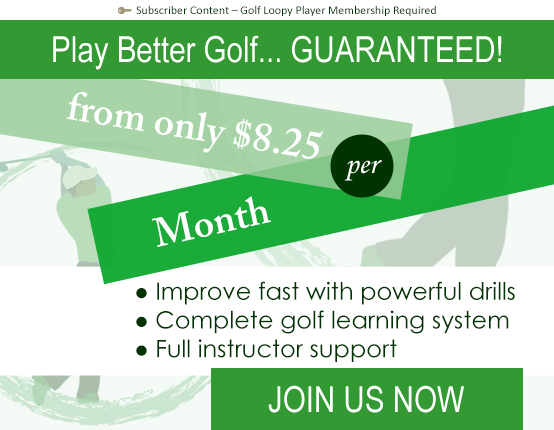 You’re now ready to start integrating the same “feeling” into your golf swing. Next up: we’ll teach you how to sequence your golf swing correctly, using your big muscles for effortless power and amazing club head speed, in Golf Swing Drill 506a – Downswing: Sequencing Your Swing for Power.